Animal welfare certification systems can market towards specific value groups held by different socioeconomic demographics. Research makes it possible. While a small minority of people are veg*ns, how many people take animal welfare into consideration when choosing their meat? Currently, label certifications indicating the production method of meat range from rarely seen to potentially misleading, with few studies focusing on the target audience. In this Japanese study, researchers used a hypothetical choice experiment and Schwartz’s Portrait Values scale, and identified five different types of “beef” consumers: label conscious, domestic beef preferring, price conscious, animal welfare preferring and not interested in production method. These groups had differing willingness to pay (WTP) for different labels which correlated with different self-reported values of: self-direction; stimulation; hedonism; achievement; power; security; conformity; tradition; universalism; and benevolence. These values can be sub-divided into opposing dimensions of self-enhancement (hedonism, achievement and power) vs. self-transcendence (benevolence and universalism), and openness to change (stimulation, self-direction and hedonism) vs. conservation (security, conformity and tradition). In the survey, participants could choose between three alternatives with differing labels (animal welfare and environmentally friendly), prices (between 200 to 500 yen, or $1.79 to $4.46 per 100 g), and origins (from the US, Australia, or Japan), or none of them. The label-conscious consumers cared most about animal welfare and environmentally friendly labels with little regard for price, while the domestic preferring consumers mostly displayed a preference for Japanese beef. The price conscious group would choose the cheapest option, and the animal welfare preferring group had the strongest preference for the animal welfare label. The not interested in production method class did not express a preference for any price, origin, or label. Every class aside from not interested in production method expressed some preference for the animal welfare and environmentally friendly labels. Further analysis found that women were more likely to be in the label conscious, domestic preferring, and animal welfare preferring segments, while older consumers were associated with just the animal welfare preferring segment. The not interested in production method segment were more likely to be younger, male, making higher income, and living in a highly populated area. The label conscious group’s values correlated negatively with self-enhancement, while high security and low self-enhancement characterized the domestic preferring and price-conscious groups, with the domestic preferring having slightly lower self-enhancement than security and vice versa with the price conscious. 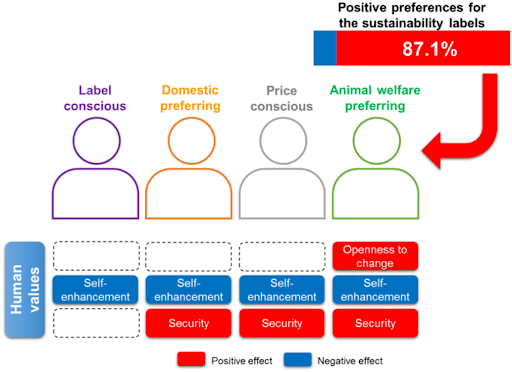 It appears that self-enhancement values decreases the chances of being in any group other than not interested in production method whereas security and openness to change increases the probability; this is likely due to how the new labeling certifications make the food seem healthier, and self-enhancement values are about pursuing one’s own interest over those of others. While these certifications are new, an astounding 90% of consumers preferred them as labels. This type of research makes it easier for policymakers to prepare certification systems that market towards specific value groups held by different demographics. Furthermore, marketers can appeal to the “prosocial” nature of their consumers, informing them of the production method’s impact on animal welfare and the environment as they implement the widespread use of these labels. Angela Pang is a digital nomad and aspiring policymaker. She is currently pursuing an MSW at Columbia to focus on creating more humane policies for animals. Sonoda, Y., Oishi, K., Chomei, Y., & Hirooka, H. (2018). How do human values influence the beef preferences of consumer segments regarding animal welfare and environmentally friendly production? Meat Science, 146. 75-86.